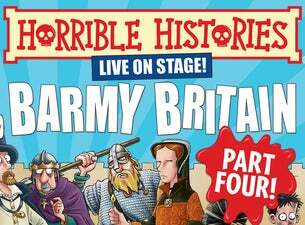 So it's time to prepare yourselves for Horrible Histories live on stage with a brand new show featuring all new scenes in Barmy Britain – Part Four! Be reduced to rubble by the ruthless Romans! Would you be shaken or stirred by Richard II? Mount a mutiny against King Henry VIII! See Mary Tudor knock the spots off Mary Queen of Scots! Will Queen Elizabeth I endure her terrible teeth? Would you be hanged by King James I for being a witch? Peep into the world of Samuel Pepys and help Georgian detectives find the headless man! Take a trip into the night with the night soil men and discover how to survive the first ever train ride! After six sensational years in the West End, Barmy Britain is back with a brand new world premiere!